So impassioned was Phil Dowson's speech at Saints this week that they could probably do worse than putting him in the starting 15 for today's game at St James' Park (kick-off 5.30pm). Saints travel to Newcastle to take on the Falcons in a match labelled 'The Big One'. More than 20,000 fans are set to flock to the home of Newcastle United to take in an Aviva Premiership game. It is being used as a dress rehearsal for next season's Champions Cup final, which will be held at the same stadium. And Saints defence coach Dowson, a former Falcons captain, is looking forward to it more than most. "Phil Dowson's been extra enthusiastic this week because he's a Newcastle United fan," explained Saints' interim head coach Alan Dickens. "He's really excited about going to St James' Park, naming every single stand. "I think he's keen (to play)! "It's a big game, they're billing it as a big game, it's preparation for next year's European Cup final and it's another venue we can tick off and say we've played there. "We're looking forward to it. "As always with football pitches, it will be a fast surface and make for a fast game." Like Dickens, the Saints playing squad have been enjoying Dowson's enthusiasm. "Dows has had to explain to a handful of the lads what football is and the significance to him of playing at the home of Newcastle and his memories as a kid growing up and watching them," said utility back Harry Mallinder. "But for a lot of us, we know it's a great stadium and a great opportunity. "Newcastle are doing very well, pushing for that top four and they're up at that top end. "They've put in some great performances and they've got players in all positions who are threatening. 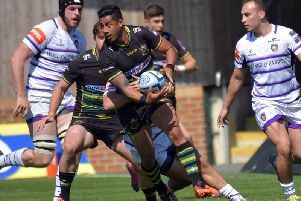 "When we played them here (Saints lost 24-22 to Newcastle at Franklin's Gardens in December), we did well for long periods of the game but let ourselves down in certain areas. "Hopefully we'll rectify it this weekend and get one up on them."